When it comes to liquid smoke, Colgin is the biggest brand out there! 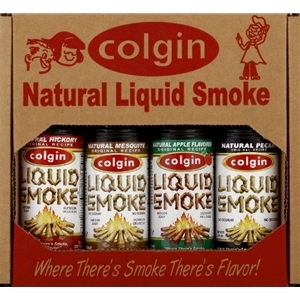 If you are looking for a great gift idea, this Colgin Liquid Smoke four pack gift set is perfect! You get to choose which four Colgin Liquid Smokes are included - choose four different ones or four of the same variety - the liquid smoke possibilities are endless! A great gift at a great price! (4 ounce size bottles). Choose from the items listed for the first liquid smoke to be included in the gift box. Choose from the items listed for the second liquid smoke to be included in the gift box. Choose from the items listed for the third liquid smoke to be included in the gift box. Choose from the items listed for the fourth liquid smoke to be included in the gift box.